SACRAMENTO (CBS13) — Sacramento Regional Transit is the one being taken for a ride on this night, by a computer hacker. That hacker forced RT to halt its operating systems that take credit card payments, and assigns buses and trains to their routes. The local transit agency alerted federal agents following an attack on their computers that riders may not have noticed Monday. “We actually had the hackers get into our system, and systematically start erasing programs and data,” Deputy General Manager Mark Lonergan. Inside RT’s headquarters, computer systems were taken down after the hacker deleted 30 million files. Bitcoin has risen sharply in the last year from around $1,000 in December to more than $8,000 on Monday. “I would say they’re probably young, because they just want to show off,” Eldridge said. RELATED: Who Used A Small Child In Package Theft Attempt From Marysville Porch? Eldridge says the hacker will likely find an online forum to take credit for the hack, and that they may not be local. “The person who hacked it may have simply had an exploit that he was running in the background on his machine, and then got a hit, ‘Hey RT is available to be hacked,'” Eldridge said. RT claims it managed through the trouble, without a significant slow down for riders, and that no employee or customer identities were stolen. A row over political correctness erupted as the The Girl Scouts of America warned parents not to encourage their daughters to hug relatives who give them presents at Christmas. The organisation suggested that, if young girls were told to hug aunts and uncles, they might later in life feel they "owed" physical affection to someone who bought them dinner. One expert accused the group, which has 1.8 million members, of risking "a mass hysteria about physical contact with loved ones". The Girl Scouts' advice to parents was titled "Reminder: She Doesn’t Owe Anyone a Hug. Not Even at the Holidays". It was was issued partly in response to revelations and allegations about sexual misconduct by a series of high profile men in politics, entertainment, and the media. Instead of hugs it suggested parents should tell their daughters they could thank relatives with a smile or an air kiss. In a statement the organisation said: "Think of it this way - telling your child that she owes someone a hug either just because she hasn’t seen this person in a while, or because they gave her a gift, can set the stage for her questioning whether she 'owes' another person any type of physical affection when they have bought her dinner, or done something else seemingly nice, for her later in life." It added: "There are many other ways to show appreciation, thankfulness, and love that don’t require physical contact. "Saying how much she’s missed someone or thank you with a smile, a high-five, or even an air kiss, are all ways she can express herself, and it’s important that she knows she gets to choose which feels most comfortable to her." Dr. Andrea Bastiani Archibald, a developmental psychologist for the Girl Scouts of America, said many children would naturally want to hug and kiss family members, friends, and neighbours, but those who were reticent should not be made to do so. She added: "The notion of consent may seem very grown-up, and like something that doesn't pertain to children, but the lessons girls learn when they're young about setting physical boundaries, and expecting them to be respected, last a lifetime." However, Dr Janet Taylor, a New York psychiatrist, warned against "mass hysteria" and said it was important not to make children "afraid of who they should not be afraid of". She told ABC News: "I just caution parents about limiting family attachment and that kind of loving space that a lot of time only happens at the holidays." Actress Amber Tamblyn, who has campaigned against sexual harassment in Hollywood, backed the Girl Scouts. She said on Twitter: "Our daughters owe no one hugs, smiles or kisses and we should start teaching them this young." But some parents reacted angrily on social media. One said: "This is absolutely ridiculous. I MAKE my kids hug and kiss family members and close friends of the family when we say hello and goodbye!.It’s a sign of respect!!" In statement the Girl Scouts of America said: "In light of recent news stories about sexual harassment we are proud to provide girls’ parents and caregivers with age-appropriate guidance." Drug company Concordia overcharged the NHS by millions for a key thyroid treatment, the Competition and Markets Authority has provisionally found. The CMA said that last year the NHS spent £34m on its drug, liothyronine, up from about £600,000 in 2006. The amount the NHS paid per pack rose from around £4.46 in 2007 to £258.19 by July 2017, an increase of almost 6,000%. Concordia said it did "not believe that competition law has been infringed". The price change occurred in the years after the drug was de-branded in 2007. The CMA said the price rise took place despite "broadly stable" production costs. Canadian drugs giant Concordia sells drugs to patients in more than 100 countries. Liothyronine tablets are primarily used to treat hypothyroidism, a condition caused by a deficiency of thyroid hormone affecting at least two in every 100 people and which can lead to depression, tiredness and weight gain. Until earlier this year, Concordia was the only supplier of the drug. CMA chief executive, Andrea Coscelli, said: "Pharmaceutical companies which abuse their position and overcharge for drugs are forcing the NHS - and the UK taxpayer - to pay over the odds for important medical treatments. "We allege that Concordia used its market dominance in the supply of liothyronine tablets to do exactly that." Prescription medicines that are still under patent can be expensive, but the government caps profits from any that are sold to the NHS to keep costs low. But this system does not cover so-called "generic medicines", where a drug's patent has run out. The loophole means the price of older, established drugs coming off patent can rocket. A company, after filing and obtaining appropriate approval, can start trading the rebranded medicine and set a high price for it through a process known as "debranding". It's something the Competition and Markets Authority has challenged a number of drugs companies over. Mr Coscelli stressed that, at this stage in the investigation, the findings were provisional and there had been no definitive decision that there had been a breach of competition law. Concordia said the pricing of liothyronine had been conducted "openly and transparently with the Department of Health in the UK over a period of 10 years". "Over that time, significant investment has been made in this medicine to ensure its continued availability for patients in the UK. "We continue to work co-operatively with the CMA as it proceeds with its investigation." It added that the CMA's statement included matters that pre-dated Concordia's ownership of its international segment, which it bought in 2015 from investment firm Cinven and other sellers, including Hg Capital. The CMA has also written to those two firms. "I get some from Greece, some from Mexico"
Before she started taking liothyronine, Tara Riddle said her life was "utter, utter exhaustion". She told BBC 5 live: "I had to lean on something, rather than stand, I couldn't go out, I couldn't shop. It was awful, absolutely awful." Having researched her condition online she convinced her GP to prescribe her liothyronine which she took for four weeks. "My life came back completely," she said. "Then I called my GP and he said 'I am so, so glad, but I'm afraid I am not allowed to to give you any more because they are so expensive.'" Tara is now forced to buy the drug overseas via the internet. She said: "I get some from Greece, some from Mexico. I talked to my MP about it and he said they could be dirty drugs, and I said I know, but I said I wasn't going to go back to that bad place I was in. "The NHS is paying around £900 for 100 tablets, and in Greece and Turkey they can be got for about £3. The NHS is paying way, way too much and there's something wrong." An NHS England spokesperson said: "This action sends an important enforcement signal to relevant generic drug manufacturers, and also wholesalers, that taxpayers and the NHS will not tolerate market abuses." Dr Mark Vanderpump, former president of the British Thyroid Association, explained how he saw the cost of liothyronine rocket: "Historically the drug cost the NHS about £20-30 a month. The new cost was over £300 a month. "Patients were telling me they could go to a foreign capital and pay about £4-5 a month, so there was a massive difference in what the NHS was being charged versus what people were accessing it at at a European level." If the provisional finding is upheld the CMA can impose a fine of up to 10% of Concordia's annual worldwide turnover. Earlier this year, Concordia was also accused of pushing up the price of a "lifesaving" NHS drug by striking a deal not to compete with another firm. The CMA said in provisional findings that Actavis and Concordia fixed the market for hydrocortisone tablets. Concordia also said then it did not think it was in breach of competition law. The CMA said the liothyronine case was one of a number it was looking at within the pharmaceutical sector. Previously, the watchdog has fined drugs giant Pfizer and Flynn Pharma nearly £90m in relation to what it called "excessive and unfair prices" for the anti-epilepsy treatment, phenytoin sodium capsules. It also fined a number of pharmaceutical companies a total of £45m in relation to anti-depressant medicine paroxetine. Both those decisions are under appeal. The CMA is pursuing another seven investigations into several companies in relation to drug pricing and competition issues. 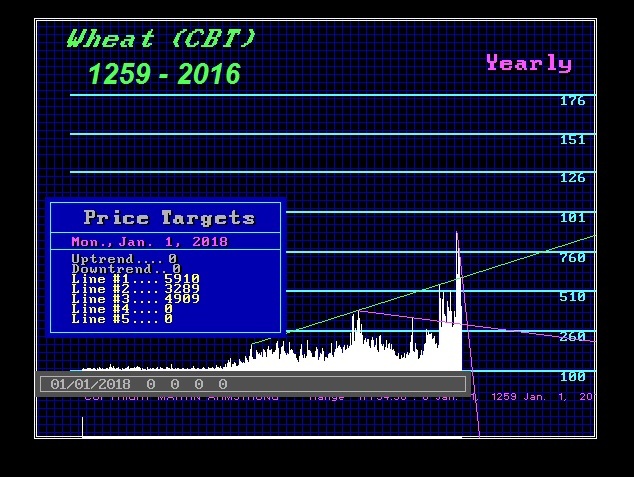 The most serious forecast that we see from our computer models has been a rise in agricultural prices caused by Global Cooling – not Global Warming. Crops cannot grow without the sun and water. 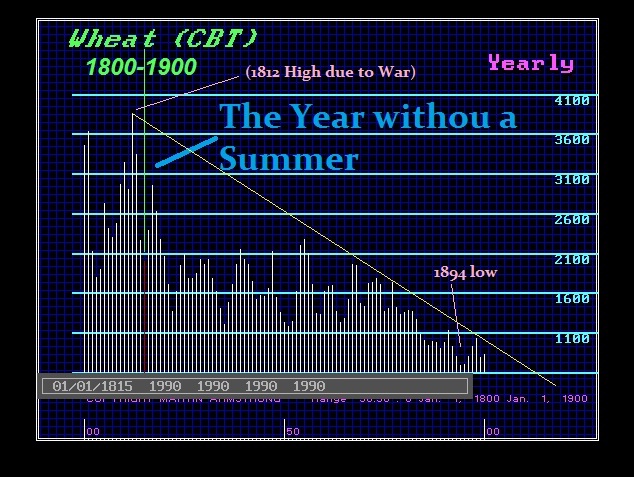 Historically, when the weather turns cold, the crops fail. 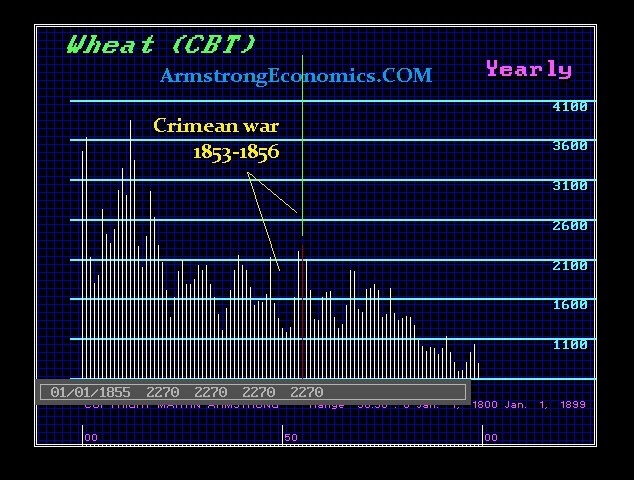 There is no question that food prices will rise during periods of war when crops cannot be planted and armies require food on a priority allotment. However, Mother Nature sticks her finger into the pot to stir things up. 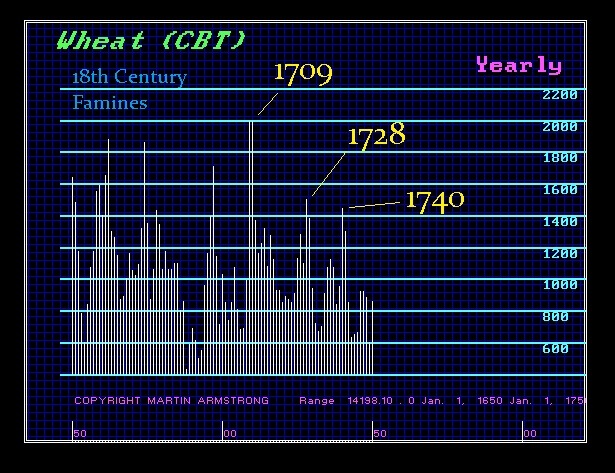 The famine cycle is also an 8.6-year frequency, but the volatility aspect comes in units of 12 rather than 6. 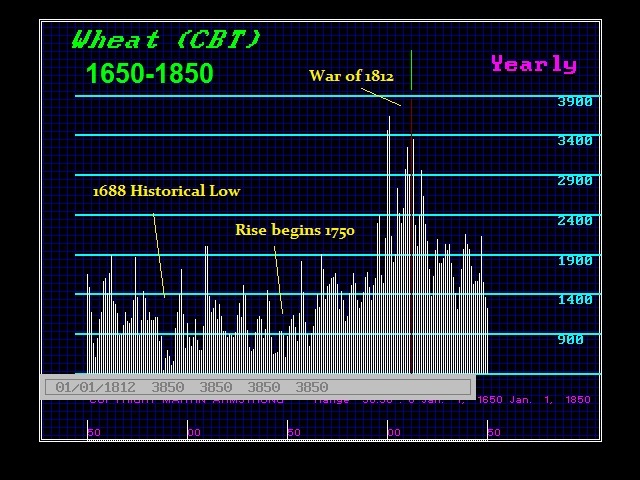 Our database on wheat from 1259 forward (excluding our data on the Roman Empire grain prices), reveals that there is a serious risk of famine from 2020 onward. It appears that we may very well enter a 12-year rally into the year 2032. Our Bifurcation Models are reflecting also a gap in time between 2020 and 2031 suggesting a trend appears to last for that period of time. The downside of taxation, and particularly inheritance taxes, has driven farmers to sell their land to conglomerates just to pay the inheritance taxes. This has resulted in genetically altering crops to increase yield. While genetically altered crops do not really appear to present a major health concern as many seem to argue, the real danger is the fact that during the past 100 years, 94% of the world’s edible seed varieties have vanished. The downside of socialism which has attacked the rich, we have sacrificed the historical model in our food supply for corporate decision making that bribes politicians handing them their needed money to remain in office with each election. The consequence of this corruption has been the concentration of our food supply into an ever-shrinking basket of diversity. Today, 75% of the world’s food comes from only 12 plants and 5 animal species (see source). 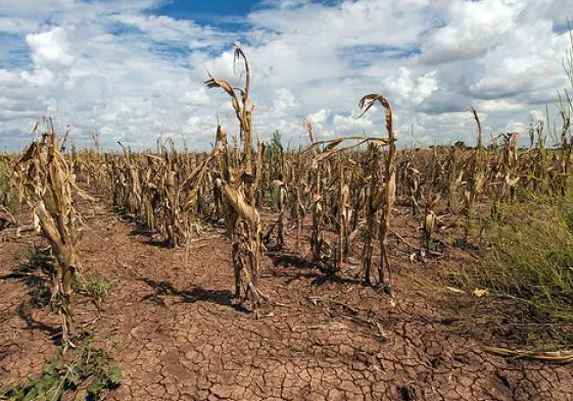 This lack of biodiversity has seriously increased this risk of widespread crop disease, and throw in the climate change turning colder, corporate decisions are not the way to protect society. Corporate boards are typically dominated by lawyers and accountants. They are not scientists nor do they even make proper decisions for investment or currency hedging. Corporations will never be able to cope with a sudden change and then make decisions that will impact the world. Major companies, such as Monsanto, could find themselves in control of the fate of human existence with the decisions being made by lawyers and accountants fixated on their bottom-line. The period ahead, 2020-2032, appears to offer something much more different. While politicians keep pushing Global Warming because they can tax emissions, the risk of a monumental human disaster lies in the opposite direction. The entire theory of Ice Ages emerged after the discovery in 1772 of wooly rhinos and mammoths were frozen in ice with plants still in their stomachs. Suddenly, science woke up and came to the shocking realization that climate can change drastically with no notice. We have the technology today to grow food inside without even soil. This is something one should consider to put in your basement as 2020 approaches on the horizon. Re: With 'Hog Apocalypse' on hold, what do we do about the pesky wild pigs taking over Texas? Mike Brewer has tried all kinds of corn bait to lure feral hogs into a $1,000 trap at his Sunnyvale pecan orchard. He even mixed the corn with strawberry gelatin because the pigs love strawberries. The hogs dig around the trees and trample the earth. They eat his pecan harvest off the ground. It costs Brewer and his wife, Kathy, weeks and weeks of labor to patch up the soil around the trees. "It's a constant battle," Brewer said this month. Wild pigs may not look like much, but they're among the most intelligent animals in the United States, which makes them formidable adversaries. And they've taken over Texas and have been documented in every county, according to Texas Parks and Wildlife. "If you're not already dealing with pigs, you're going to," said Brett Johnson, an urban biologist for the city of Dallas. The pigs cost Texans about $52 million in agricultural damage every year. Even if you're not a farmer, here's why you should be concerned: Feral hogs tear up lawns, parks and golf courses; they skulk around highways and train tracks; and they poop in our water supply. Estimates peg the number of wild pigs in the U.S. at 4 million or more— and somewhere between 2 million to 3 million are in our state. Sure, Texas is a gun-friendly state, but don't assume that getting rid of wild pigs is as easy as shooting or poisoning them. Population control is far more complicated than the state agriculture commissioner's stalled plans for a "Hog Apocalypse." What do I need to know about feral hogs? Wild pigs can have two litters a year, typically giving birth to three to eight piglets per litter. Texans would have to remove two-thirds of the feral hog population every year to keep the number of pigs stable. Right now, the state is removing 29 percent of the population. They are mostly nocturnal, seeking cover near water and eating both plants and other animals. About 79 percent of the land mass in Texas is considered suitable environment for wild pigs, which descended from hogs brought in by European settlers in the 1500s. Adult feral hogs don't have many natural predators and are highly adaptable. Tepid efforts to capture them may result in "trap-smart" pigs. Unprovoked attacks against humans are rare. Some cities have taken up abatement efforts. Earlier this year, Dallas leaders approved a three-year $347,000 contract with a trapping company that corrals pigs on city-owned land and sells them to a meat-processing plant in Fort Worth. Traps: Box traps are usually good for one or two pigs, or small herds of swine, called sounders. The bigger corral traps catch many hogs at once. The automated kind use video to allow you to monitor the trap and its gate from your computer or cellphone but can set you back thousands of dollars in equipment. Check whether your city has any rules against the trapping of wildlife. Fences: Any type of fence can help keep pigs away from your lawn and flower beds in urban and suburban areas. Electric fences are one choice, but some homeowners are reluctant to use them because of children. Some homeowner associations and cities might also prohibit their use, so do your homework. Guns: Texas law requires a hunting license and the landowner's permission to shoot wild pigs. If you are the landowner or a designated agent, however, you don't need a hunting license to dispatch a hog causing damage on your property. But who is a "designated agent" is fuzzy, so check with your local game warden. In the end, you may not be able to shoot at all: It's illegal to discharge a gun in some cities, including Dallas. Choppers: Helicopters, that is. Texas law allows landowners to contract with gunners to take out hogs from above. There are rules, of course. The hunter must file paperwork with Texas Parks and Wildlife. Some helicopter operators charge landowners for the service, while others do for it free because they make money by selling seats to hunters. However, this tactic likely won't be an option for landowners in urban and suburban areas. Local trappers: You may find leads in Texas hunting magazines and newspaper classifieds, or by asking employees of chambers of commerce, feed stores and swine-holding facilities. A group called Texas Hog Hunters Association keeps an online list of hog trappers. Vet the service provider's credentials before doing business with the person or group. Setting off traps without doing reconnaissance: Get a rough head-count. Johnson, the city of Dallas biologist, suggests that you wait to trap the sounder instead of individual pigs so that other pigs don't become aware of the trap. But sometimes you need to catch one pig to start on the others because one aggressive hog may be keeping the rest away, said Randy Smith, supervisor of the Fort Worth district of the Texas Wildlife Services program. He recommended using trail cameras — weatherproof, camouflaged devices that can take nighttime photos — to estimate the number of pigs roaming your land. Poison, at least for now: Texas Agriculture Commissioner Sid Miller spoke enthusiastically about a "Hog Apocalypse" earlier this year when he approved the use of a controversial poison called Kaput Feral Hog Bait. The poison contains a chemical called warfarin, an anticoagulant that makes pigs bleed internally, ending in slow, painful deaths. Some people voiced concerns about the unknown effect on the food chain, and the manufacturer withdrew its state registration for the poison. Because it was classified as a state limited-use pesticide, Texas can no longer license people to use the bait. Contact your city or county to find out whether they have hog control programs or referrals. Check official resources for instructions on how to build a trap and other abatement measures, such as this website on "coping with feral hogs" by Texas A&M AgriLife Extension, this guide by Texas Parks and Wildlife or this guide shared by the U.S. Department of Agriculture. Contact your local district of Texas Wildlife Services, a program that combines federal and state resources and that is authorized by law to control feral hogs and other animals. The Fort Worth district, which covers North Texas, can be reached at 817-978-3146. My brother just told me he attracts feral pigs with old motor oil. They understand that it repels insects and they go crazy for spilled oil from skidders and tractors and such. My brother knows a lot about hunting. The statue depicts Dominican brother St Martin de Porres. 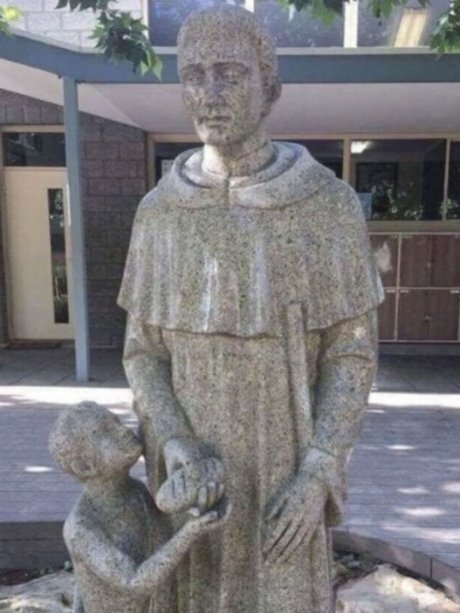 An Adelaide Catholic school has covered up a statue of a religious icon after it created a stir on social media because of its apparently unintended suggestiveness. The statue was recently installed at Blackfriars Priory School in Prospect and depicts a 16th century saint handing a bread loaf to a child's outstretched hand. But, as numerous online commentators have pointed out, the effect is somewhat different. In the past 12 years, at least two former Blackfriars teachers — Stephen John Stockdale-Hall and Ronald William Hopkins — have been jailed for sexually abusing students at the school. Today, the school said the design of its new statue looked fine on paper but acknowledged it could be interpreted in a more sinister way. "The two-dimensional concept plans for the statue were viewed and approved by the [school's] executive team in May but upon arrival the three-dimensional statue was deemed by the executive to be potentially suggestive," principal Simon Cobiac said in a statement. "As a consequence, the statue was immediately covered and a local sculptor has been commissioned to redesign it." Mr Cobiac said the embarrassing artwork was created in Vietnam by a sculptor who had done other work for the school. "The sculpture is a famous depiction of the tireless work of St Martin de Porres, a Dominican brother, for the poor and downtrodden of the 16th century," he said. "The school apologises for any concerns and publicity generated by this matter and is taking action to substantially alter the statue." Social media users were stunned no-one had spotted the inappropriate overtones. "Did nobody look at the design first?" one person tweeted. Satirist Ben Pobjie said he was "just glad Blackfriars school noticed how suggestive the statue was before they turned the water feature on". The school recently made headlines because of a hoax letter by one of its students distributed to thousands of others claiming the Year 12 biology exam would have to be re-sat. Ratko Mladic gives a thumbs up as he enters the International Criminal Tribunal for the former Yugoslavia (ICTY) on Wednesday to hear the verdicts in his genocide trial. Ratko Mladić, the former commander of the Bosnian Serb army and one-time fugitive from international justice, has been sentenced to life imprisonment after being convicted of genocide, war crimes and crimes against humanity by a UN tribunal at The Hague. More than 20 years after the Srebrenica massacre and his first indictment by the international criminal tribunal for the former Yugoslavia (ICTY), the soldier nicknamed the “butcher of Bosnia” has been found guilty of of multiple offences. As he entered the courtroom, Mladić gave a broad smile and thumbs up to the cameras – a gesture that infuriated relatives of the victims. The long-anticipated verdict was delayed for more than half an hour after Mladić asked the judge for a bathroom break. When he returned, his defense team then asked for proceedings to be halted or shortened because of his high blood pressure, but judges denied the request. Mladic stood up shouting at the judges, and was forcibly removed from the courtroom to allow the verdicts to be read. Mladić, now 74, was chief of staff of Bosnian Serb forces from 1992 until 1996, during the ferocious civil wars and ethnic cleansing that followed the break-up of the Yugoslav state.He faced 11 charges, two of genocide, five of crimes against humanity and four of violations of the laws or customs of war. He was cleared of one count of genocide, but found guilty of all other charges. The separate counts related to “ethnic cleansing” operations in Bosnia, sniping and shelling attacks on besieged civilians in Sarajevo, the massacre of Muslim men and boys at Srebrenica and taking UN personnel hostage in an attempt to deter Nato airstrikes. Delivering the verdicts, judge Alphons Orie said Mladic’s crimes “rank among the most heinous known to humankind and include genocide and extermination”. He dismissed mitigation pleas by the defence that Mladic was of “good character”, had diminished mental capacity and was in poor physical health. Relatives of victims flew into the Netherlands to attend the hearing, determined to see Mladić receive justice decades after the end of the war which claimed more than 100,000 lives. Mladić’s home village of Bozinovici, however, retains a street named after the former general, where he is praised as a symbol of defiance and national pride. Mladić was one of the world’s most wanted fugitives before his arrest in 2011 in northern Serbia. He was transferred to the ICTY in the Netherlands, where he refused to plead. A not guilty plea was eventually entered on his behalf. Through much of the trial in The Hague, he was a disruptive presence in court, heckling judges and on one occasion making a cut-throat gesture at the mother of one of the 8,000 victims of the 1995 Srebrenica massacre. The trial in The Hague, which took 530 days spread over more than four years, is arguably the most significant war crimes case in Europe since the Nuremberg tribunal, in part because of the scale of the atrocities involved. Almost 600 people gave evidence for the prosecution and defence, including survivors of the conflict. The trial is one of the last to be heard by the ICTY, which is due to be dissolved at the end of the year. There had been uncertainty over whether Mladić would appear in court for the verdict. His defence lawyer, Dragan Ivetic, said that doctors should check Mladić’s health because a court appearance might kill him. “We’ve had a medical doctor that has said, actually based on his diagnosed condition, any form of stress, including a trial proceeding, may increase his chance of having a stroke, a heart attack or dying,” Ivetic said on Monday. The verdict comes a year after former Bosnian Serb leader Radovan Karadžić was found guilty of genocide over the 1995 massacre in Srebrenica and sentenced to 40 years in jail. The business scene has advanced to a whole new level. In November 2013, New Jersey was home to 13 online gambling casinos and poker brands. As of October 2017, there are 20 casinos and poker clubs in New Jersey. Altogether, online betting has represented almost 10 percent of New Jersey’s aggregate casino income in 2017. Also, it seems lawful that online gambling will keep on climbing. While the league is maturing day by day, it is breaking records simultaneously. Now for the eight month in a row, New Jersey’s online betting industry produced more than $20 million in terms of revenue. The numbers from the month of October likewise brought the yearly gross income add up to up to $200 million, setting another yearly record with two months still to go in 2017. As indicated by the most recent Monthly Internet Gross Revenue Report, which the New Jersey’s Gaming Enforcement released on Wednesday, the $20.6 million produced in October averages out to $663,471 every day. Of that, the state pulled in $3.6 million in monthly tax revenue. The aggregate was an expansion of $200,000 contrasted with September’s numbers, and was up extensively from the $16.7 million produced in October 2016. As per investigators from PlayNJ.com, the state is poised to create $250 million by the end of the year. They likewise report that since New Jersey legitimized online betting in November 2013, the industry has $682.6 million in lifetime net revenue. That has brought about $119.4 million in taxes for the state. Borgata, which hosts brands like playMGM, Party, and Pala, is as yet the market pioneer having produced $4.2 million in October, and $180.7 million lifetime. The legalisation of online gambling in Pennsylvania came as an additional boost to the gambling industry. After Pennsylvania’s casinos joined the league of online gambling, 26 million US citizens have got the access to the platform and the revenues are getting bigger day by day! The Federal Communications Commission will vote to put an end to its net neutrality rules next month, commission chairman Ajit Pai said today. The proposal will reverse the Title II classification of internet providers, which allows the agency to put strict limits on their behavior, and replace it with the old “information service” classification, which a federal court has ruled is less comprehensive, weakening any protections that might replace those currently in force. That is, if the agency even wanted to replace them: it sounds like this proposal will leave the internet without any sort of net neutrality protections. The full text of the order — a final revision of the the proposal that received 22 million comments over the summer — will be released tomorrow. For now, we only have a summary from Pai. The FCC’s goal is to set up the Federal Trade Commission to handle all anti-competitive disputes, and the idea is that if ISPs violate their stated policies, the FTC will be able to take action. This is a puzzling plan and one that the FCC has to be well aware will not offer any legitimate consumer protections. Companies’ terms of service and related policies aren’t meant to protect consumers, they’re meant to protect companies — and they can change at a moment’s notice. While it’s entirely possible that a company could violate its own policies and get in trouble with the FTC, a company could also just promise open internet protections until it doesn’t feel like following them any more, rewrite its policies, and then implement new and potentially discriminatory practices. And while this all might work out if American consumers had several internet providers to choose from at home, so that they could switch away from a bad provider and over to one that values an open internet, that’s far from the case. Less than a quarter of the country has two or more home internet providers that offer basic broadband speeds — so if you don’t like what your provider is doing, you’re stuck. "“[This proposal] throttles access, stalls opportunity, and censors content.”"
Republicans have argued that the FTC is the expert agency on anti-competitive practices and ought to be in charge here, but that obfuscates what’s really happening. The FTC is a single agency tasked with protecting consumers across a wide range of industries — it simply doesn’t have the focus of the FCC to narrow in on just internet providers. Nor does the FTC have the ability to proactively set tough rules. The FTC can only establish guidelines, which gives internet providers a lot more leeway to experiment with practices that work to their own advantage. In reality, the FCC is trying and will likely succeed in giving internet providers the leeway to try whatever policies they want over their own networks. Pai’s argument has been that by giving internet providers this flexibility, they’ll be able to make money in new ways, which they could then pour back into building out their network. The theory is that they could then bring service to areas that wouldn’t be profitable enough to reach today. Since the agency wants to get more and more Americans connected, that could be considered a win — though the service may look different than what we receive today in some very important ways. The rules go up for a vote next month, on December 14th, when they’re almost certain to pass. The FCC is majority Republican right now, and Republicans have been calling for the end of net neutrality ever since the policy was first put in place. There’s also no reason for Pai to put the measure up for a vote unless he knows it’s going to pass. After the vote, it’ll take a month or so before the new policies appear in the Federal Register and go into place, overwriting the only net neutrality rules. That doesn’t mean everything will be all over, though: there’s certain to be a court battle — or two, or three — to follow. Net neutrality advocates will take the commission to court, likely claiming that it failed to find enough evidence to warrant overturning a decision made just two years earlier. Advocates may also say the commission ignored process, having made up its mind from the start and ignoring millions of comments from the American public in support of net neutrality. Supporters of net neutrality have long argued that the rules are necessary to protect consumers’ from price gouging and protect small companies from anti-competitive behavior. Paid fast lanes could allow wealthy companies to pay for better service, giving them an edge over upstarts (say, YouTube vs. a brand new streaming service). A lack of discrimination rules could let internet providers like Comcast and AT&T advantage their own content — like NBC and HBO — over others’, by making it stream faster or not count toward data caps. And an absence of no blocking rules means that internet providers could stop apps that compete with their own from reaching consumers. People in Haiti continue to rebuild and re-establish their daily routines Jan. 13, 2015, following the five-year anniversary of the magnitude 7 earthquake that hit Jan. 12, 2010, destroying buildings and killing as many as 316,000 people. The Trump administration announced Monday that 59,000 displaced Haitian earthquake victims who have been living in the United States under temporary status must leave the country within 18 months. Where does the administration expect them to go? According to the Los Angeles Times, more than 3o,000 Haitians affected by the order live in Florida; another large number live in New York City. 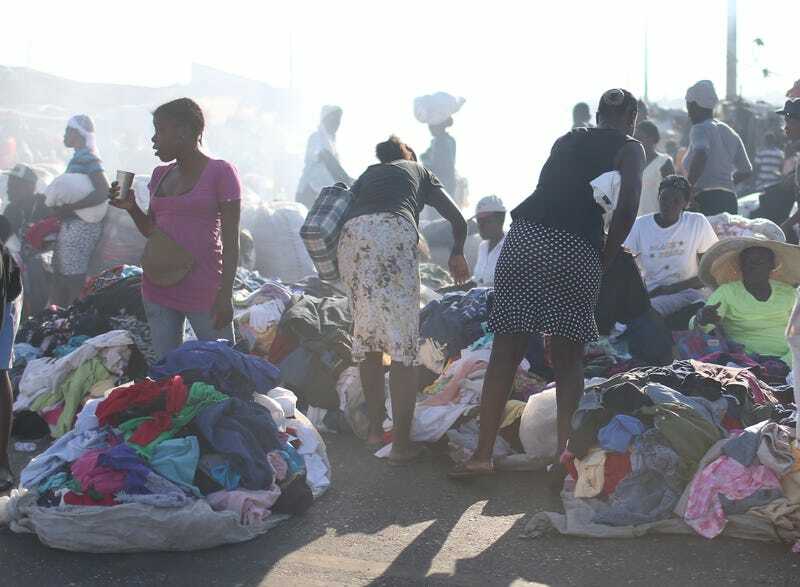 Many of the Haitians entered the country illegally in 2010 after a powerful earthquake devastated their island, which was already considered one of the poorest places in the Western Hemisphere. They were protected against deportation under Temporary Protected Status, a program created by Congress during the 1990s that helped prevent large numbers of people from being sent back to areas that were suffering from wars or natural disasters. John Kelly, while still the secretary of homeland security in May, said that the conditions in Haiti had improved to the point that the U.S. would not likely continue extending the temporary protection. He extended Haitian protected status for an additional six months, but simultaneously urged them to prepare to leave the U.S.
Where are they supposed to go? On Monday, acting Homeland Security Secretary Elaine Duke affirmed that Haitians would still be required to leave, but said the order would not be effective until July 22, 2019. If Haitians covered until temporary protection are able to show that they have other legal claims to remain in the United States under immigrant status, they will be allowed to stay, administration officials said. Former Vice President Emmerson Mnangagwa will be sworn in as president on Friday, according to Zimbabwe's state broadcaster. The report by the government-controlled Zimbabwe Broadcasting Corporation (ZBC) said Mnangagwa will arrive in the capital Harare later on Wednesday. Mnangagwa, 75, had not been in the country since November 6 when he was sacked by Robert Mugabe, his former ally. 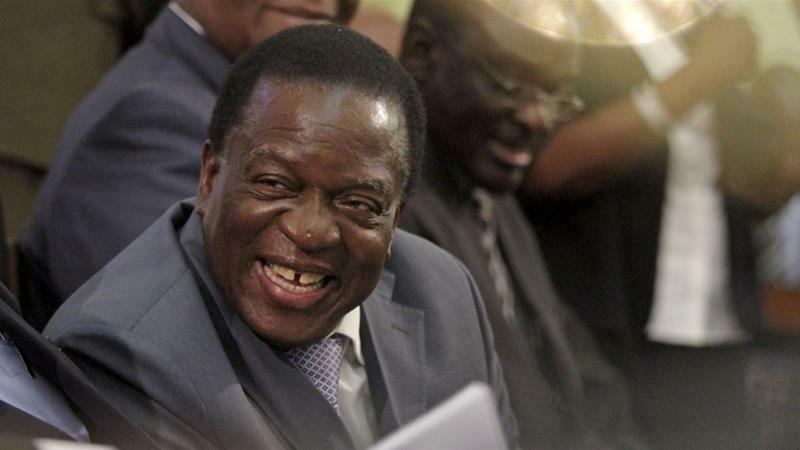 Could Mnangagwa be Zimbabwe's comeback crocodile? Mugabe resigned as president on Tuesday evening after a week of intense pressure following a military takeover. Much of that pressure stemmed from Mugabe's decision to remove Mnangagwa, who is seen as close to the Zimbabwean armed forces. At the airport where Mnangagwa was due to arrive, large crowds were gathering to welcome the former vice president. Ezekiel Gadzi, 52, told Al Jazeera he was elated at Mnangagwa's return because Mnangagwa had promised that he would return to make Zimbabwe a more democratic country. "A new era is about to begin and I look forward to Mnangagwa becoming leader of Zimbabwe. Had it not been for him and the support he got from the war veterans and the army, we would still be under the yoke of Robert Mugabe. But Mnangagwa has is now returning to lead a new dispensation," he said. Tatenda Chari, a unemployed teacher in his mid-twenties shared Gadzi's sentiments and said that he hoped the incoming leader would improve Zimbabwe's economy. "I'm very happy because I see the possibility of a new Zimbabwe with Mnangagwa. I've been sitting at home with my parents and I can't even put bread on the table because of Mugabe, so I place my hope in this new president that he won't let us down," she said. Shortly after being sacked, the former vice president fled the country claiming that he and his family had been threatened by Mugabe. The former president's wife, Grace Mugabe, called Mnangagwa a "coup plotter" and a "coward" in a speech shortly after his sacking. That incident was also said to have ruffled feathers within Zimbabwe's ruling establishment. Mnangagwa, like Mugabe, is a veteran of the struggle for independence from Britain. He is considered by the military to be an appropriate replacement for the former president, who at 93 was Africa's oldest leader. Grace Mugabe's ambitions for the presidency were fiercely opposed by the armed forces, who warned that they would not allow someone who had not fought in the independence war to take helm of the country. Despite their relationship taking a sharp turn in recent months, Mnangagwa and Mugabe had once been strong allies, even sharing a cell during their imprisonment. Mnangagwa had been a member of Mugabe's cabinet since the country's independence and vice president since 2014. Around 2012, something started going wrong in the lives of teens. In just the five years between 2010 and 2015, the number of U.S. teens who felt useless and joyless – classic symptoms of depression – surged 33 percent in large national surveys. Teen suicide attempts increased 23 percent. Even more troubling, the number of 13- to 18-year-olds who committed suicide jumped 31 percent. In a new paper published in Clinical Psychological Science, my colleagues and I found that the increases in depression, suicide attempts and suicide appeared among teens from every background – more privileged and less privileged, across all races and ethnicities and in every region of the country. All told, our analysis found that the generation of teens I call “iGen” – those born after 1995 – is much more likely to experience mental health issues than their millennial predecessors. What happened so that so many more teens, in such a short period of time, would feel depressed, attempt suicide and commit suicide? After scouring several large surveys of teens for clues, I found that all of the possibilities traced back to a major change in teens’ lives: the sudden ascendance of the smartphone. Because the years between 2010 to 2015 were a period of steady economic growth and falling unemployment, it’s unlikely that economic malaise was a factor. Income inequality was (and still is) an issue, but it didn’t suddenly appear in the early 2010s: This gap between the rich and poor had been widening for decades. We found that the time teens spent on homework barely budged between 2010 and 2015, effectively ruling out academic pressure as a cause. However, according to the Pew Research Center, smartphone ownership crossed the 50 percent threshold in late 2012 – right when teen depression and suicide began to increase. By 2015, 73 percent of teens had access to a smartphone. Not only did smartphone use and depression increase in tandem, but time spent online was linked to mental health issues across two different data sets. We found that teens who spent five or more hours a day online were 71 percent more likely than those who spent only one hour a day to have at least one suicide risk factor (depression, thinking about suicide, making a suicide plan or attempting suicide). Overall, suicide risk factors rose significantly after two or more hours a day of time online. Of course, it’s possible that instead of time online causing depression, depression causes more time online. But three other studies show that is unlikely (at least, when viewed through social media use). Two followed people over time, with both studies finding that spending more time on social media led to unhappiness, while unhappiness did not lead to more social media use. A third randomly assigned participants to give up Facebook for a week versus continuing their usual use. Those who avoided Facebook reported feeling less depressed at the end of the week. The argument that depression might cause people to spend more time online doesn’t also explain why depression increased so suddenly after 2012. Under that scenario, more teens became depressed for an unknown reason and then started buying smartphones, which doesn’t seem too logical. Even if online time doesn’t directly harm mental health, it could still adversely affect it in indirect ways, especially if time online crowds out time for other activities. For example, while conducting research for my book on iGen, I found that teens now spend much less time interacting with their friends in person. Interacting with people face to face is one of the deepest wellsprings of human happiness; without it, our moods start to suffer and depression often follows. Feeling socially isolated is also one of the major risk factors for suicide. We found that teens who spent more time than average online and less time than average with friends in person were the most likely to be depressed. Since 2012, that’s what has occurred en masse: Teens have spent less time on activities known to benefit mental health (in-person social interaction) and more time on activities that may harm it (time online). Teens are also sleeping less, and teens who spend more time on their phones are more likely to not be getting enough sleep. Not sleeping enough is a major risk factor for depression, so if smartphones are causing less sleep, that alone could explain why depression and suicide increased so suddenly. Depression and suicide have many causes: Genetic predisposition, family environments, bullying and trauma can all play a role. Some teens would experience mental health problems no matter what era they lived in. But some vulnerable teens who would otherwise not have had mental health issues may have slipped into depression due to too much screen time, not enough face-to-face social interaction, inadequate sleep or a combination of all three. It might be argued that it’s too soon to recommend less screen time, given that the research isn’t completely definitive. However, the downside to limiting screen time – say, to two hours a day or less – is minimal. In contrast, the downside to doing nothing – given the possible consequences of depression and suicide – seems, to me, quite high. It’s not too early to think about limiting screen time; let’s hope it’s not too late. This piece is particularly interesting because it’s from someone who campaigns for the Scottish Greens. He’s also a scientist, so knows what’s going on better than most politicians. Forty years ago I was studying for a Physics degree at Edinburgh University. I chose Edinburgh because it offered a course which included Meteorology and Atmospheric Physics, interests which have stayed with me since. When I came across articles about the Greenhouse Effect, this intrigued me as a scientist, but also worried me as a human being, and although it was only a theory at the time, I felt the implications if true were so severe that at the very least, we should adopt the precautionary principle and take immediate action to prevent it. It was this that led me to join the Ecology Party in 1979 and since then, politics for me has always been about climate change and the need to address it before it became unstoppable. In the seventies and eighties, the threat of an impending nuclear war was on everyone’s minds, but here was another existential threat to humanity that although distant, required no less attention to defuse or at least to quantify. Then it was a theory and if proven, we still had time to do something about it. Forty years on and the Greenhouse Effect is now known as Global Warming or Climate Change. The effects predicted are not only happening, but they are happening much faster than predicted and events over the last three years have led me to believe that this is not only irreversible, but we are now entering a period of what is known as ‘abrupt climate change’, which will lead to the breakdown of society within 30 years and near human extinction by the end of the century. To understand how this will happen so quickly, we need to appreciate that climate change is not linear. We are on an exponential curve. The three warmest years on record globally have been 2014, 2015 and 2016 (with 2017 set to join them). Floods, droughts, wildfires and storms are this year setting records and records are not only being broken, but they are starting to be broken by some margin. We’re on an curve where not only will events happen more often and be more severe, but the rate at which they increase will itself be increasing. That’s what exponential means. We also need to appreciate some of the deficiencies in climate modelling. Specifically, climate scientists (in common with nearly all scientists) are experts in their own fields only. Looking at a specific aspect of science in isolation is fine if nothing else is changing, but if everything else is changing, you need to take that into account if you’re predicting what will happen in the future. There are around 70 feedback effects now kicking in, and few if any models are taking these into account. For example, scientists studying the Arctic sea ice may take into account higher sea surface temperatures, but not the incursion of water vapour (a greenhouse gas) into the Arctic resulting from a distorted jet stream, or the impact of soot on ice albedo from increased wildfires thousands of miles away. A recent example is the speed with which this year’s Atlantic hurricanes strengthened from tropical storms to Category 5 hurricanes due to higher sea surface temperatures. This surprised meteorologists as the computer models were only forecasting Cat 2 or 3 at most. Only now are they recognising that the models are underestimating the effect of warmer sea surfaces and the additional energy and water vapour they provide. As Peter Wadhams writes in his recent book ‘A farewell to ice’, to reverse the effects of man made carbon dioxide in the atmosphere would demand a switch in global focus on the scale of the post war Marshall plan. We would need not only to stop producing CO2 but also turn over many of our factories to producing carbon capture and storage machines, and we would need to start right now. The cost to the world economies would be huge, possibly running to over $100 Trillion. If, and it’s still an if, we are capable of reversing the trajectory we’re on, there are no signs of a willingness to do so – neither from politicians nor people in general. CO2 takes over a decade to become fully effective as a greenhouse gas, and lingers in the atmosphere for decades. Methane (CH4) is 130 times as effective as a greenhouse gas in the first 3 years after release and due largely to melting permafrost is starting to rise rapidly in global concentration (another feedback). So what are we actually doing about it? ‘Emissions’ as measured by countries themselves levelled out over the past three years – but are now rising once again. Leaving aside allegations that the figures have been doctored anyway, the extra CO2 from increasing wildfires is not included (as an example, the CO2 from those in British Columbia, just one Canadian province, this year equated to the annual emissions from 40 million cars on the road). The litmus test is the actual measure of CO2 in the atmosphere – now reaching a peak of around 410 ppm and rising at a record annual rate of around 2.5 ppm per year. 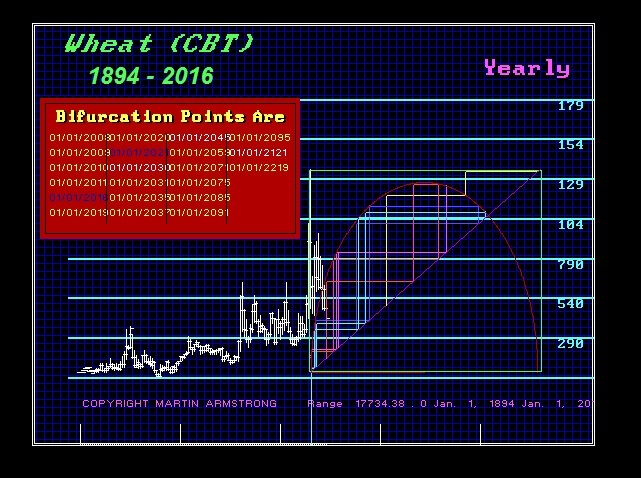 In 1989, the UN issued a warning that we had only ten years to address global warming before irreversible tipping points start kicking in. That was 30 years ago. Similar warnings have appeared since, none of them heeded. Instead of issuing warnings, more and more scientists are now coming round to the view that it really is too late. What I have witnessed over the last three years has led me to believe the same. We really are too late and are now entering the sixth mass extinction. Too many articles on climate change contain the phrase “By 2100…” or “By the end of the century…”. That really is too far away for most people to treat as urgent. While it’s difficult to make predictions, it should be made clear that the catastrophic impacts of climate change will affect us well before then. Within five to ten years I expect to see food prices rising well above inflation – perhaps by as much as 50% to 100% with some empty shelves appearing in supermarkets as specific crops are devastated (we already had a ‘taste’ of this earlier this year with courgettes and lettuce crops hit by unusual weather in Spain; world wine production is now at a 50 year low due to extreme weather events). Wildfires are already becoming uncontrollable. Portugal has seen six times its average this year. There have been fires in Greenland and in Australia during its winter, not to mention the devastation in California, Canada and Siberia. Hurricanes are becoming stronger and appearing in unusual places (Ophelia was the strongest on record in the east Atlantic and Greece is currently being hit by what is called a ‘Medicane’). Sea surface temperatures need to be over 28.5 C for a hurricane to strengthen. The Mediterranean off Italy’s coast reached 30 degrees this year. With the right conditions, it would only take one stray east Atlantic hurricane to head into the Med to cause widespread devastation. I can easily see this happening within ten years. Elsewhere we will see hurricanes and typhoons strong enough to flatten cities within the next decade. The economic implications will be immense. The impact of hurricanes Harvey, Irma and Maria in the US is expected to be around $400 Billion this year, not counting the wildfires in California and drought in Montana. Over the next decade, super hurricanes, flooding and drought will cause insurance companies to collapse. Banks will follow and pension funds will start to come under pressure. With food prices increasing way ahead of wages, disposable incomes will be hit hard, leading to worldwide economic depression. And that’s not taking into account the hundreds of millions of climate refugees (already begun in the Caribbean). With the jet stream already getting seriously messed up, or if the Hadley cells become severely disrupted, it’s not out of the question that the Indian monsoon could fail permanently and within a year we have a billion people starving. There’s a saying that if something is unsustainable it will not be sustained. Obvious, perhaps, but we have been living well beyond the sustainability of the planet for decades and continue to believe that somehow we can do so increasingly and indefinitely. That will not be sustained. So for forty years I tried to warn people. Now I tell them it’s too late and we’re f***ed, they say I’m being too negative need to give people a positive message. OK then, will “We’re positively f***ed” do?, because when we could save ourselves nobody listened, and even now when they think we still can, there is absolutely no will to do so. For a long time, we have needed to change our lifestyles and that, for most people, is a red line area. There are no quick fixes. We cannot continue with mass air transport – the only non polluting alternative to fossil fuels requires huge areas of land to be removed from food production, which is already coming under pressure due to climate change and increasing population. We need to stop owning cars (not just leaving them in the driveways) – the resource requirements and human rights implications of even switching to electric cars present largely insurmountable problems. And even if these problems can be fixed, the solution needs to come first, rather than assuming as always that the next generation will somehow pick up the bill and sort out the mess we are creating by our profligate lifestyles. And so we continue to build more runways and roads, drill for more oil, burn more forests for palm oil plantations and clear the rainforests for agriculture and logging, despite the fact that these massive environmental problems are no longer a theory but are staring us in the face. But we keep on driving and keep on flying and keep on buying things we don’t need from halfway across the globe without the slightest thought that all this will kill our children. I was perhaps naive to believe that politics would solve the problem. If the bottom line is that people will not change their lifestyles, then they will not vote for politicians who say we need to. So politicians will not tell people the truth and tell them instead that we can get by with replacing petrol cars with electric ones by some decade well in the future and convince people we’re all ‘doing our bit’ for the planet by planting a few wind turbines. They talk vaguely about carbon capture and how air transport is important for economic growth and without that we cannot tackle climate change. As a councillor I was the only one even vaguely interested in the council’s climate change plan (including both councillors and officers). And people believe them because they want to. I’ve long maintained that people get the politicians they deserve (good and bad) and they certainly don’t want politicians to tell them they can’t have their cheap holidays in Spain. I joined the Ecology Party (which became the Green Party) because it was, and still is, the only party to come anywhere close to telling people the truth on climate change. 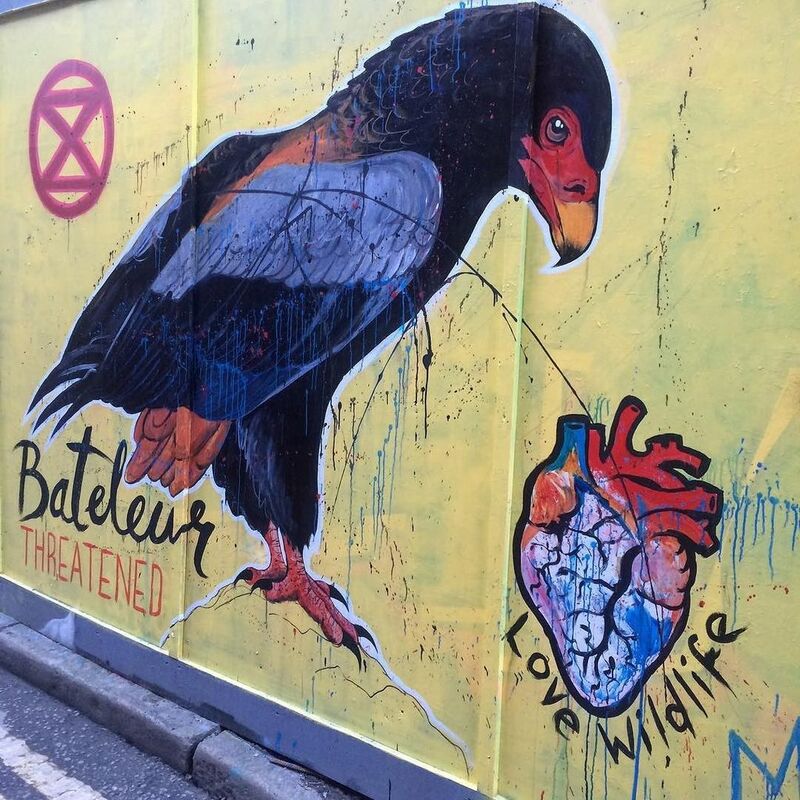 That people are generally not in the least interested in the environment that keeps them alive is borne out by the derisory vote Greens get – around 2% support except where they campaign strongly on non-environmental issues. And Green Party activists have also realised this. So they focus on being more user friendly and campaigning on issues that ‘matter to people’ like independence or austerity, rather than lose votes by telling people it’s about time they faced the harsh truth. I’ve been accused of being too Utopian, that before we address climate change we need an independent Scotland, or a Socialist Republic, or something else. And those arguments were rational thirty years ago – after all, it’s the free market Capitalist system that brought us to this position. However, thirty years ago is not now – when your house is on fire, you don’t try and get ownership of the keys, you reach for the hose. When I attend a climate rally and see it attracts less than a tenth of the numbers at a Scottish independence rally, it brings home how insane our politics has become. What planet do these people expect an independent Scotland to exist on? Venus by the look of it. So we might be f***ed, but should we give up? No, I don’t think so. We may not be able to stop the process, but we can slow it down and offer the next generation at least some kind of palliative care. I have not flown or owned a car for around 20 years and will continue that way. Because very soon my children’s generation will become angry with mine, and will ask why, in the face of so many warnings from scientists for decades, we did nothing about it. It will be little consolation, but at least I will be able to say I tried. Oh, good. Wouldn't want to interrupt the flow of platinum and diamonds out of Zimbabwe into South Africa (and hence to New York and London and Tel Aviv).